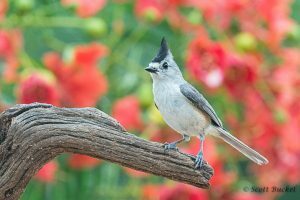 I always enjoy seeing and photographing the various titmice, I think they are cute and the move very fast. Gene, the owner of Laguna Seca Ranch, brought in the red flowers in the background and I have now forgotten their name. I do like the out of focus red and green background.